The serve is the first shot in the rally. Therefore it has a critical meaning because it's the only shot which you have complete control over. 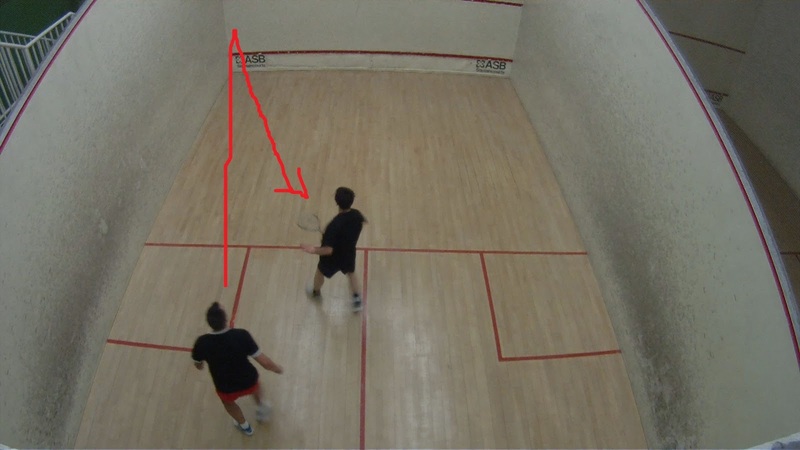 To make a lob you must aim at the highest point in the front wall and make a feeble shot. To make a smash instead simply aim low over the middle line and throw a strong shot. I suggest that you always think about the serve before doing it. Try to picture in your head where you want the ball to go and what you want your opponent to do. Based on the position of your opponent you must place the correct shots. When he is near the back corner i'd make a lob that touches the side wall at the last second and goes in the corner. I hope i provide with good content and that you are going to train hard! Have Fun! Add me on twitter for more social Fun! Is the shot that scores the most points, both for you and your opponent. This shot is crucial because failure to use it in the right moment (explained next) will result in you not taking advantage of your opponent's mistakes and therefore reduce the chances of you scoring a point. 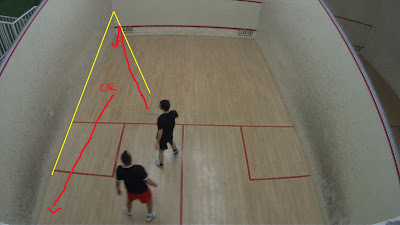 Of course you can make drop shots every time but it is harder to make it when the ball is in the back and it is easier when the ball is near the front wall. As a general rule you should never counter a drop with another drop unless you are absolutely sure to score the point because the position you will be in will make it really hard for you to recover to the T.
Make it a habit to use the drop when near the front wall, there are a lot of players that because they are afraid to miss the shot they don't do it. Instead just do it and learn to do it by practicing. Exposure to failure will make you grow faster. Try to always mix the sequence of your shots so that your game is not obvious. aiming as low as possible and close to the corner (not in the corner). The best drop shot goes just above the Tin and then bounces in the nick never to be retrieved again. You can practice the drop shot alone by implementing in your practice this two exercises. Make the best drop you can and then try to retrieve it by extending yourself bouncing the ball very high so that you can easily start again by making another drop shot. Make a Boast and move to the front corner, then make a drop. Try to retrieve the ball. Go back again in the corner and repeat. To come back to the corner try to make some volley while walking back. You can then choose to play the next combo: Boast/Drop in the same corner or in the opposite. This exercise is more effective but it requires more time. The Triangle Theory of Squash. The triangle theory is an advanced tactic that allows you to know where to place your shot when a certain event happens. As i mentioned in my article about the drive and the article about tactics i told you that you must use the drive to bring your opponent in the back corner and keep him there until he makes a mistake and you can close the deal with a drop shot. This is the most consistent tactic in squash which i call the long/short alternation. When your opponent throw a ball that comes in the center since you know that your movement pattern requires you to stay in the center you will take all the space you need and by doing so your opponent will be forced to stay behind you. Therefore the best shot you have to make is the drop shot or a drive that is better than the one made by your opponent. Geometrically talking you must throw the ball inside the triangle created by the side wall and the ball your opponent's throw. If you hit the ball inside that triangle you will be in advantage because your shot will be more accurate than your opponent's and it will make him run and allow you to control the center. When you make a drop shot inside "the triangle" you will almost 99% score a point. That's because since you are in control of the center your opponent will have to run around you to hit the ball and the time he will loose will eventually make him miss the shot. This is a great habit for me because if i don't capitalise on this kind of situation i tend to make rallies last too much and it is useless. I hope this boost your game and send me a message if you like this concept! Cya on Court. In the past months I've been publishing videos about how to make different shots. This last concept is so important i want to explain it in depth. Since we make a stereotyped swing that goes from up to down and we hit the ball in the same place relatively to us, the only definying factor for where the ball will go is how we orient our body. If we face the side wall we will make a drive. if we face the back corner we will make a boast. Therefore you now can undestand how to forestall your opponent's shots by simply watching him play. In the video there is also a great exercise called the 4 corners. How to make a boast. The boast is a shot that bounces on one side wall before reaching the front wall. There are two tipes of boast: normal and reverse. The reverse boast is a typically useless shot because it leaves space for your opponent to attack you, but if done at the proper time can work magic. 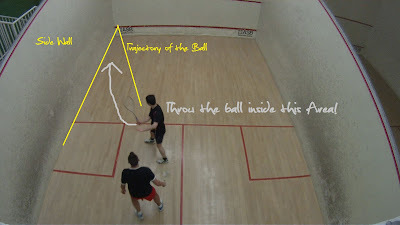 To make a reverse boast means to throw the ball on the opposite's side of the court side wall and make it so that the ball reaches the front wall. The boast can be done by simply orienting your body so that you are directly facing the back corner. The ball will bounce on the side wall and then reach the front wall. If the angle of the shot is too large the ball won't reach the front wall. Instead if the angle is too thin the ball will bounce on the third side wall and that will make the ball come to the center and that is not good. always aim for the front corner when making a boast. You can do both a high and a low boast. The purpose of the first is tipically for defense when you need time to recover to the T. The low bost can be tryed when late to make a drive, but tipically it's best done if you are in advantage to break the rhythm risulting in him getting surprised and you scoring. The attack boast is better to be done once in a while to make it unespected and score a point. The boast comes naturally when the ball surpass you. As a general rule use it only in that case. When doing the boast to attack, make sure you are in the proper position (the ball must be nearer to the back wall than you) and use as much strenght as possible while lowering the plate of the racket. Instead if you need time to recover to the T do a slow high boast by rotating the plate so that it is facing upwards, this boast generally gives a huge advantage to your opponent but if you manage to come back to the T it is worth trying.